The other day I wrote about the current exhibition and book of Olmsted's parks and landscapes by Lee Friedlander. 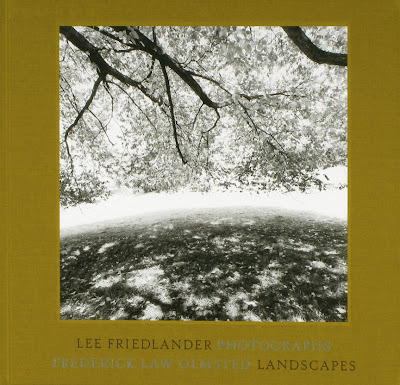 Well the book - Lee Friedlander: Photographs Frederick Law Olmsted Landscapes - arrived yesterday. I only had time for a fairly brief browse, but it's a gorgeous book. The pictures live up to expectations and the printing and paper is just superb - the images are very "photographic" with a wonderful depth. And the overall design and feel of the book results in a very satisfying experience for the reader (viewer?) - at least for this one anyway. Everything down to the colour and feel of the linen cover and the sort of tipped-in print on the front comes together so well. I share your appraisal of this marvelous book. It feels wonderful and the images come close to original prints in their fine gradation and depth. This book is an example of the singular joy that a beautifully bound and printed book that you may hold can bring to the viewer. I made a point of going to the Met to see the originals, and while it too was a joy, the ability to slowly and repeatedly savor this book will be a lasting reward. My copy arrived Friday. Outstanding images. Thanks again for the reminder! Hi, I work for a company that has created a simple social commerce solution, and we’re hoping to reach non-profit professionals who are looking for creative ways to raise money online. In just five minutes, your organization can set up your own personal storefront and choose from thousands of products to recommend and sell. Anytime someone buys something off your Lodge, your organization gets 10% of the sale. It’s a great way to mobilize donors because you make money every time they purchase products off your marketLodge! It’s easy to set up a Lodge and display it wherever you go online—set up a widget for your website or blog, or include a link to your Lodge in your email newsletters. For more information, please go to http://marketlodge.com.